© 2001, Cisco Systems, Inc.
addressing requirements of Service Providers’ customers. • Configure static routing with a customer. Identify different levels of customer redundancy requirements. 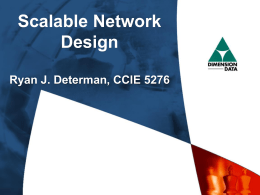 Describe the customer-to-provider routing requirements. Describe the customer’s AS-number requirements. customer network and the Internet. • No redundancy on link or equipment failure. • Redundancy on link or equipment failure. 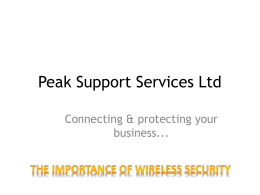 • No redundancy on Service Provider failure. • Good solution for lower speeds. several physical links between a pair of routers. • Redundancy on link failure; no redundancy on equipment failure. • Load sharing in this setup is optimal. • Good load sharing is still possible to achieve. links to multiple Internet Service Providers. • Redundancy on link, equipment or Service Provider failure. • Primary/Backup setup is complex without Service Provider assistance. 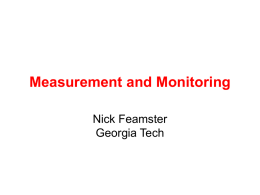 • Good load sharing is impossible to achieve; the best solution is nondeterministic load control. 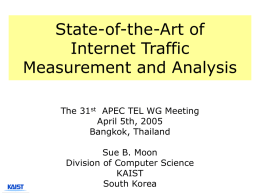 • Static routing is always adequate. • Do not use BGP in this setup. must be used on the primary link. 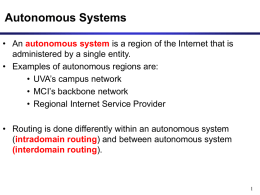 • Static routing is used on the dial-up connection. • Static routing is preferred if you can detect physical link failure. • BGP must be used in this setup; static routing is not possible. connected to a single Service Provider. • Multi-homed customers have to run BGP with Service Providers. • They must use public AS numbers for their autonomous system. There are two aspects to load sharing: outgoing and return traffic. • Return traffic is several times larger than the outgoing traffic. • Primary requirement is load sharing of return traffic. • Outgoing traffic is several times larger than the return traffic. • Proper load sharing of outgoing traffic is most important. • Which scenarios require BGP and why? 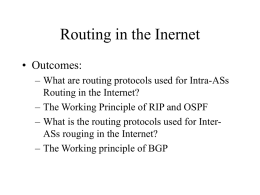 • Why can’t the other routing protocols be used? • Why can’t dial-up lines always be used as backup? to provider independent (PI) addresses? customer to different ISPs be totally controlled? • Configure redistribution of static routes into BGP. is configured on provider router. IGP if the customer is running EIGRP. the customer is running OSPF or RIP. • Redistribute static routes into BGP, not IGP. • Use static route tags for consistent tagging. offered to a customer, including QoS services. Assign a tag to each combination of services. the customer with the proper tag. matched individually due to routemap limitations. Do not insert permit all at the end. router for ISDN dial backup. route is inserted into the BGP table and cannot be removed from there. order for other BGP routes to be considered. to make sure other routes take precedence. Only the first half of the route-map is displayed. 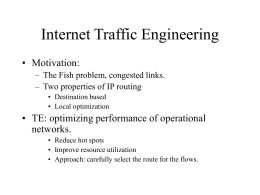 • Outgoing traffic load sharing is easy to achieve. • All return traffic arrives at the same provider edge router. customer’s address space into the provider backbone. customer’s address space for backup purposes. traffic for part of customer’s address space. • Design and deploy dial backup solutions with static routing. • When do you have to migrate from static routing to BGP? routers propagated to the other ISP routers? being advertised to other ISPs? • How are static routes used to implement backup solutions? running BGP with the Service Provider. • Customer address space is advertised on every customer edge router. 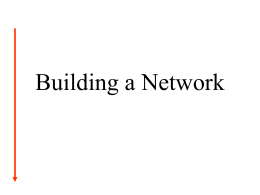 default route to the rest of the customer network. • BGP route is revoked if the LAN interface of the edge router fails. whole customer’s address space into BGP. customer network, not to null 0. • Advertise default route to the customer through BGP. customer announces only the assigned address space. customer uses only its own AS-number. • Optionally, no-export community has to be set on customer routes. advertised in outgoing BGP updates. the default route is not present in the BGP table. outbound BGP filters (prefix-list, filter-list or routemap). • Private AS numbers should not be advertised into the Internet. 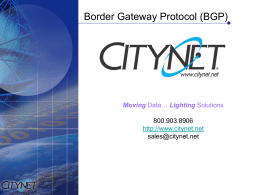 customer BGP routes are advertised to other Service Providers. outgoing updates sent to specified neighbor. AS-path before the update is sent. • No Service Provider configuration is required. link when the primary link fails. neighbor to be distant (several hops away). interfaces for dial backup or load sharing purposes. address is advertised in BGP. installed, ISDN call is placed. identical to the static routing scenario. parallel links run between a pair of routers. path and installs it in the IP routing table. customers running BGP with the Service Provider. • Which AS numbers can customers use? • What is a private AS number? to the rest of the Internet? numbers from the AS path? primary/backup link for outgoing traffic? primary/backup link for incoming traffic? sharing on parallel links connected to one router? on parallel links connected to separate routers? BGP with the Service Provider. announcing it to both service providers. using BGP to provide redundant connectivity. internally; the other has to be translated. • On one EBGP adjacency the real AS number is used. one assigned by the second ISP. AS numbers assigned by the service providers. or even any other private AS number. 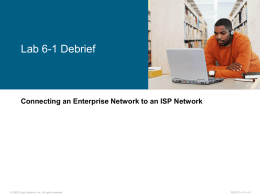 number to ISP1, and as a different AS to ISP2. has to adapt the incoming AS-path filters. sent to the neighboring AS and no further. • MED is not compared even if it is set by AS 387 and AS 123. • The decision will probably be based on the AS path length. never arrives to AS 234.
customers connected to one service provider. or more smaller address blocks. space separation according to link bandwidths. 234 to use the direct link. to achieve the “direct link” option.